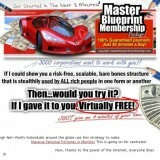 “Master Blueprint Membership System”, by Martin Thomas and found at masterblueprintmembership.com, is an online marketing system that claims to show how to make multiple passive income streams using their resources. Master Blueprint Membership System calls their resources corporate resources, and claims that what you will be doing to earn money will be with professional ethical business principles. That is a tall order in this business and we looked into just how accurate their claim is. Master Blueprint Membership System is really good at building up its business appearance. At the heart of it, what you’d be doing is posting ad links as an affiliate, although they build it up as taking advantage of corporate fire sales. It is just link posting as an affiliate marketer. Not an easy type system to earn well with if you don’t put substantial time, effort and some investment in something like Master Blueprint Membership System. Corporate fire sales in the corporate world deal with bonds, international banking and high financing. What Master Blueprint Membership System offers is something different. What Master Blueprint Membership System offers to do is show you how to find and benefit from large companies in bankruptcies that are having fire sales. Master Blueprint Membership System trains you on how to resell products in the online retail world. They offer $100 in credit to invest in making a first deal, which they say will come within 20 to 30 minutes. They leave out just how much it will actually cost past that initial credit on the sales page of the Master Blueprint Membership System offers website. They are also not very clear on exactly what those multiple streams are either. It costs a one time fee of $117 to join Master Blueprint Membership System. It is a bit on the pricey side, but it is a Clickbank product so getting a refund within 60 days shouldn’t be a problem. Many complaints have been registered online from disappointed users who, although worked the system properly according to their program, did not make as much as what Master Blueprint Membership System offers claims they would. Most of the complaints have to do with using this system and finding out it is far more labor intensive than Master Blueprint Membership System offers claims on their page site; however, they do manage to make something of a profit so it’s not a scam. There are less expensive systems out there that offer similar link posting services and the training is as good as any other for even half as much. I’m not recommending Master Blueprint Membership System offers but you can at least get your initial $117 investment through Clickbank if you act within 60 days in case you do decide to try it.